GODFATHER OF THE KREMLIN. 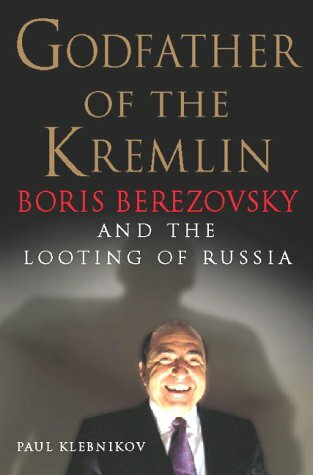 Boris Berezovsky And The Looting Of Russia. Boris Berezovsky's business career has been meteoric. In just six years he managed to seize control of Russia's largest auto manufacturer, largest TV network, national airline, and one of the world's biggest oil companies. When Moscow's gangster families battled one another in the Great Mob War of 1993-1994, Berezovsky was in the thick of it. He was badly burned by a car bomb; his driver was decapitated. A year later, Berezovsky emerged as the prime suspect in the assassination of the director of the TV network he acquired. Although plagued by scandal, he enjoyed President Yeltsin's support, serving as the personal "financial advisor" to Yeltsin and his family. In 1996, Berezovsky organized the financing of Yeltsin's re-election campaign-a campaign marred by fraud, embezzlement, and attempted murder. Berezovsky became the president's most influential political advisor, playing a key role in forming governments and dismissing prime ministers. Having labored to privatize the economy, Berezovsky privatized the state. Based on hundreds of taped interviews with top businessmen and government officials, as well as on secret police reports, contractual documents, and surveillance tapes, Godfather of the Kremlin is both a gripping story and a unique historical document. Internet / Mail Order Only. by check or money order. Always, books are returnable with no questions asked, for any reason. All books with dustwrappers are shipped with a Brodart protective book jacket cover unless otherwise noted. Oversize (quarto, folio or really heavy) books, and sets often require a request for additional shipping if the order is a priority or international order.